This famous church is located in the very heart of the Old Town, founded in 1219 – the very same year when crusaders landed in Tallinn. Center of Catholic and later Lutheran religion in Estonia – The Dome Cathedral (Church of St. Mary). First founded as the small wooden chapel dedicated to the Virgin Mary, with years rebuilt in bricks and finally – lime stone. Dome Cathedral in Tallinn standing like the live and impressive history book, telling the numerous stories of noble Baltic German families. The Upper town for seven centuries was the stronghold of Estonian nobility, which consisted mostly of German and some Swedish knight’s families. 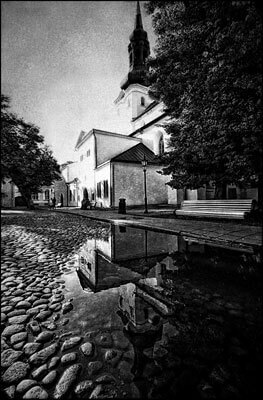 In the past all people were believers and visited the church and the most influential of them were even buried in the main church of Estonia. The Dome Church of Virgin Mary in Tallinn was constantly rebuilt as the wealth and might of the knights grew. The chapels – burial vaults of the nobles were attached to the church one after another. Many of these families have left a big mark on the history of Estonia in Swedish and Russian periods of rule. They were councilors of the court Knighthood Assembly chairman and of course – military officers and generals participating in different armed conflicts on the side of different countries. Inside, the Dome Cathedral in Tallinn is a treasury of 17th century coats of arms of the nobles. Tallinn has the second largest collection in the world (after the one in Stockholm) of family trees and coats of arms on Baltic German – Estonian nobility. Around 110 of them are displayed on the walls, inside of the church. It’s been over 300 years, but still we have the descendants of these families coming to visit the homeland of their ancestors. The floor in the church consists of medieval tombstones, they have the names of the buried or even the images of knights engraved in stone forever. The sarcophaguses of the main church in Tallinn keep the remains of Johann von Kruezenstern – serving in the fleet of the Russian Empire he was the first sailor on a round-the-world trip sailing under the Russian flag. Another Russian Admiral originating from Scotland – Samuel Graig – defeated the Turks on the Black Sea and Swedish forces on the Baltic Sea, putting an end to Swedish military ambitions forever. Another vault is the resting place of Pontus de la Gardi – originally a French general serving to the Swedish crown and taking over for the Russian Tzar – Ivan the Terrible. Tallinn’s Dome Church has stories to tell.